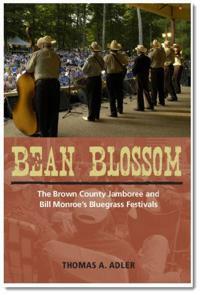 Tom Adler recently published a book Bean Blossom: The Brown County Jamboree and Bill Monroe's Bluegrass Festivals. He has extended that volume with a dynamic new website that is a wonderful collection of the history of Bean Blossom. The site hosts reference materials, additional graphics, audio & video, source documents and many photos. There are many interviews and other materials that give a much greater depth to the essence that is Bean Blossom. From the 1940s through 2008, there are cataloged graphics and images of the evolution of the Bill Monroe festival. The early black and white images are breathtaking in their own right. While few in number, they evoke an emotion of life during the early days of bluegrass music. A great addendum to the book is provided by the Errata - a collection of corrections to the historical book. As Adler is informed or locates errors, he will post the correct information on the site. This could easily be printed out and kept with your copy of the Bean Blossom book. 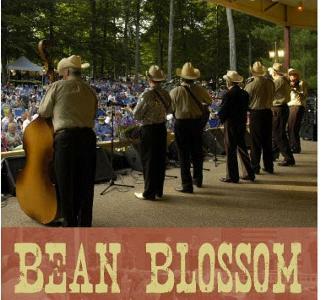 The slide show, however, is what Bean Blossom is all about. From its early beginnings to the present day, it illustrates the breadth, scope and growth of the landmark festival in Brown County. It highlights Monroe, the stage and the impromptu jams that happened each year at the festival. Whether you own the book are going to get a copy or just hold a casual interest, you'll probably want to stop by and spend some time looking through this collection.